As an organisation striving to reduce its environmental impact and one that is dedicated to supporting the community and improving local surroundings, shentongroup is proud to be a part of Love Where You Live. 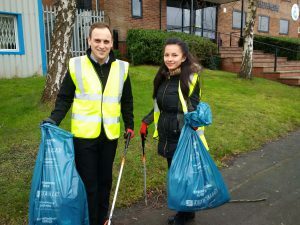 Love Where You Live is a Test Valley Borough Council initiative that challenges local businesses and residents to step-up and to do their bit towards making the area cleaner and tidier. 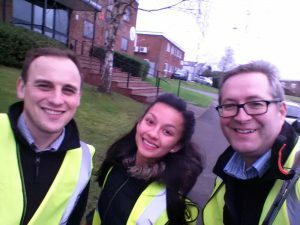 Once-per-month on a Friday afternoon, shentongroup staff took to the streets of our borough, picking litter to improve the cleanliness and image of this wonderful area that we all share. shentongroup firmly believes that, if we all contribute something towards our environment, no matter how small, it makes a big, big difference. Just some of the small changes that shentongroup has made include opting for ‘no bag’ deliveries from Sainsbury’s; utilising multiple recycling bins; only using biodegradable bin bags and sourcing FSC-certified recycled stationery from sustainable sources. Love Where You Live was launched in 2011 and aims to encourage everyone within the area to help out to improve where they live and work in Test Valley. You can also help by becoming a Community Litter Picker, by arranging a Community Clean Up and by suggesting an area that needs a tidy. For information, please visit Test Valley’s website here. As you’ll see in the accompanying images, we not only collected a lot of unsightly rubbish, but we also had a great time doing so. To find out more about the initiatives that shentongroup is involved in, click here. To speak to a member of the UK’s leading technical experts in Standby Power, Uninterruptible Power Supplies and Combined Heat & Power Systems, get in touch now.